These instructions will guide you through a series of ski adjustments that will methodically improve your ski’s performance until it’s fully optimized for your personal technique. I’ve tried to boil the whole thing down to be as concise as possible. So if you find yourself questioning any of the concepts behind these instructions, have a look through the blog on this website for answers. If you can’t find what you are looking for there, consider getting the 2nd edition of the book Fin Whispering. It covers the whole topic of ski-tuning in detail. 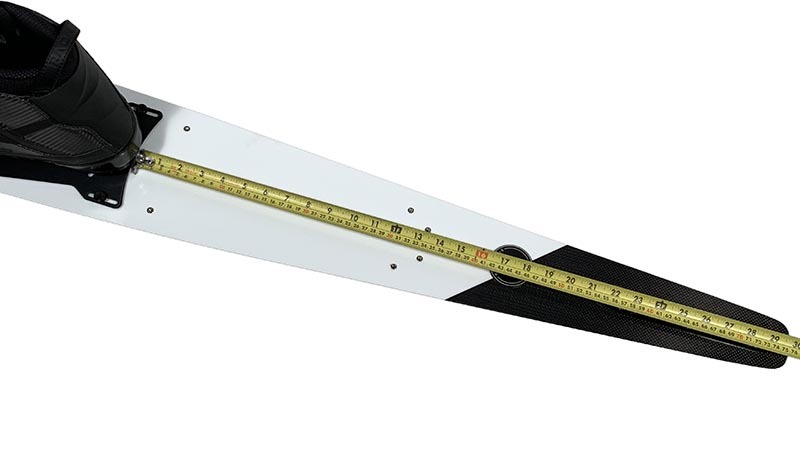 The following tuning method is designed so that you won’t need a caliper or any other specialized tools, just a simple ruler to get started, a 5/32 in. or 4 mm Allen wrench (like most of the free ones you got from Ikea etc. ), and someone videoing your skiing from the boat. Always keep the index marks at the front of the fin equal to the index marks at the back. This ensures optimal orientation of the WhisperFin’s turbulators for maximum acceleration. ALWAYS use video to determine how your ski is behaving. I regularly see top skiers misdiagnose their ski’s behavior based on “feelings,” e.g., tip-grab can be caused by too much tip in the water or by a tail that’s too slippery. With video, you can avoid undermining your setup with a misdiagnoses. To achieve your best overall setup, focus mostly on how your ski behaves from mid-turn through the transition into the cut. When faced with different behaviors on either side of the course, you can optimize the setup for your weakest side. When in doubt, bias your tuning in favor of offside turns. There’s an inherent purity to offside turns that leads to optimal setup results. Only make tuning decisions based on ski behaviors that occur while skiing with sound technique. Making tuning decisions based on skiing errors leads to setups that reward errors and punish good technique. Understand that bindings control how much the tail slides through mid-turn at max lean angles, and the fin controls how hard the tail of the ski hooks up while transitioning out of turns into the cut. Using the right tuning tool for the issue you are addressing achieves the best results. Wherever there is spray, the ski is sliding sideways through the water to some degree. Turning makes the most spray, so that’s where the ski slides sideways the most. Fin and binding adjustments affect how much the tail slides relative to the tip, and in response to how much ski tip the skier engages with the water. The term “smear” refers to any time the ski’s tail is sliding more than the tip, causing the ski to rotate as it slides around turns. The smaller you run your WhisperFin the better—right up until the tail gets too slippery at the very end of the turn. The further forward you can run your bindings, the smaller the fin can be. And the further forward you can run your fin’s leading edge, the more power you’re ski will have—right up until the tip gets too grabby. So for maximum performance, our goal here is to establish how small and how far forward the fin can be setup without exceeding the limitations of the ski’s design, our binding location or our skiing technique. The following instructions are organized under same red labels used above to name the various flowchart loops. The “Fin Block Setup Loop” ensures you don’t damage your WhisperFin with the adjustment screws in a tight fin block. While most fin blocks allow for easy fin movement while loose, it’s not unusual to find a a really tight fin—even when the fin block is as loose as possible. To avoid damaging a tight fin, read: www.finwhispering.com/tight-fin or watch the Adjusting a Tight Fin video before proceeding with any fin adjustments. It’s a good practice to occasionally make sure that your fin is tightly secured by the fin block and that the fin block itself is tightly screwed onto the ski. Does the tip sometimes grab suddenly in turns? The further forward your fin’s leading edge (LE), the more yawing tip engagement you will get in response to your habitual skiing inputs. A forward fin helps keep the tip down and engaged while turning and cutting, making turns tighter and acceleration quicker. If LE is too far forward for your ski and/or technique, you will occasionally drive too much tip into the water causing the tip to grab. These deep-tip tip-grabs can be survivable spikes in tip pressure, or they can be the form-crushing end of your pass. When we survive tip-grabs, we usually overcompensate for the next turn by not engaging enough tip. This will deliver a long, lazy, incomplete turn. An inconsistent oscillation between tip-grab and lazy school bus turns is a common symptom of the fin’s leading edge being too far forward. The best way to tell if the tip is too deep in the water when it grabs is by reviewing video of each tip-grab, frame-by-frame. The tip might also feel like it’s grabbing if there’s not enough tail support. If the tail is too slippery, even modest amounts of tip engagement will cause the ski to over-rotate into a hockey-stop/tip-grab. The Tip-tuning Loops in this flowchart tame both causes of tip-grab by establishing how deep the tip is in the water at the time of the grab. If video shows that the water-break is on the front 12″ of the tip, your fin’s LE is probably too far forward. If the water-break is between your front toes and the front 12″ of your tip, the tail of the ski is probably too slippery and needs more support from either a forward binding move or more fin area. The further forward you can run the fin’s leading edge, the better the ski will turn and accelerate. But being able to use longer LE measurements is heavily technique-dependent. If you approach turns with too much weight on your back leg and most of the ski’s tip out of the water, you’ll have to yaw the tip into the water to turn well (see “yaw” in the illustration above). But yawing just the right amount of tip into the water is hard to do consistently because you are slicing the ski’s narrow edge into the water. It’s much better if you can pitch the ski’s tip down into the water prior to the turn by standing up over your front foot. Then as the ski rolls into the turn, the tip is already engaged and won’t need to be yawed into the water to tighten the turn’s radius. The better you get at preloading the tip as you approach the ball, the further forward you can run your fin’s leading edge. Unfortunately, there is nothing we can do with setup to help us pitch more tip into the water—including binding moves. Binding moves have almost no effect on tip attitude but a LOT of effect on how the tail smears around turns. Pitching lots of tip into the water prior to the ball is purely up to you and your technique. Is the ski’s tail too slippery? Other terms used to describe a slippery tail are “loose,” “sliding” and “unsupportive.” It’s also said that the ski is “over-rotating” or “over-smearing.” All of these terms mean the tail is sliding around turns more than desired, especially at the finish of the turn. The tail is a lot too slippery if you tend to get the occasional tip-grab at the end of some turns. It’s a little too slippery if the ski tends to over-rotate past the ideal angle for the cut. 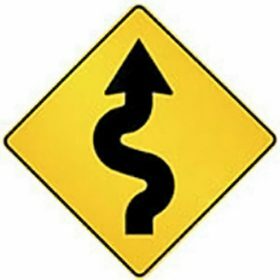 It’s not slippery enough if the turn is too big lazy and round, i.e. the infamous school bus turn. And it’s just right if the tail of the ski sweeps around the turn then hooks up softly with just the right amount of cross-course angle. how much of the ski’s tip is engaged with the water. Once the bindings and fin are set, traction at the tail is fixed the whole time we are skiing. This traction only varies to the extent that the fin is rolled in and out of play with ski roll angles. Tip engagement, on the other hand, is highly variable and totally controlled by the skier. Since the ski is sliding sideways to a degree whenever there is spray, changing how much tip there is in the water affects how much traction the tip of the ski has relative to the tail. When lots of tip is in the water, the tip drifts less than the tail and the ski rotates causing it to turn. When there’s little tip in the water, the tip drifts about the same as the tail, and the ski wants to go straight. The reason for explaining this here is because it helps to understand why turning can be so inconsistent. Inconsistent tip engagement causes inconsistent smear—despite the fixed level of traction at the tail. So when optimizing smear with the fin and bindings, it needs to be set so we don’t spin out into a hockey stop whenever we accidentally engage too much tip. When reviewing your video, look for examples of maximum tip engagement (but with a balanced stance on the ski). If you can survive encounters with deep-tip over-smear, then traction at the back of the ski is right where you want it. Can the bindings move forward without issues? It’s not unusual to run out of forward binding adjustment with a good WhisperFin setup, especially when mixing binding and ski brands. It’s no big deal if this happens, it just means it’s time to add some area back to the fin to control smear. It’s likely you couldn’t move much further forward anyway before running into deteriorating ski behaviors stemming from an overloaded tip. You’ll know if you’ve moved too far forward when you can’t get the tail to smear enough, or if the ski’s tip starts getting vague, mushy or draggy. You’ve definitely gone too far when it starts digging in or washing out altogether when overloaded (mostly an issue for strong advanced skiers). Perhaps the most subtle sign that you may have moved the bindings too far forward is a slight tendency to run a narrow line towards the next ball. If you encounter a significant lack of tip support, there’s a good chance you are on a ski that is too small for your size and/or power (food for though when purchasing your next ski). In any case, following the flowchart will guide you away from these issues. The bindings control how much the tail smears, especially through mid-turn. The further forward the bindings, the longer the ski’s tail, the more support it has, the more leverage the fin has, and the less the tail will smear. The further back you move, the more the tail will smear through mid-turn. This is especially true for skiers who achieve steep lean angles that roll the fin out of effectiveness as illustrated below. As the ski rolls flatter out of the turn, the fin rolls more into play and takes over smear control from the bindings. This is why fin area should be focused on how the tail smears through the transition into the cut. And the smaller the fin, the smoother this transition gets—up until the tail slides too much right at the finish of the turn. If this happens, the bindings should go forward if possible. If this turn-finish over-smear persists, fin area needs to be increased. For skiers who do not achieve steep lean angles, fin area will play a more significant roll through mid-turn than it does for advanced skiers. The flowchart accounts for this. Is most of the tip-grab or over-smear gone? the tail of the ski gets too slippery right at the end of turns—regardless of what you do with the bindings (cause there’s not enough fin area as the ski rolls flatter out of turns). At this point, move the bindings back to their previous position and add fin area until the tail of the ski sweeps around turns right into perfect angle for the cut (see the Fine Tuning Loop). This fin area reduction is to increase smear, whether there wasn’t enough to start with or to regain the smear lost to a forward binding move. Adjusting the two top adjusters at the same time might seem odd to you if you have prior ski setup experience. But it keeps the turbulators ideally oriented for maximum acceleration. The leading edge adjustment is to compensate for how these fin area adjustments affect tip-engagement. The two-screw fin area adjustments we are doing include making the fin both deeper and longer, so they affect both tip-engagement and smear at the same time. Not only does the longer LE increase tip-engagement, making the fin deeper delivers more tip-engagement from your habitual inputs too. The counterclockwise ¼ turn of the back adjuster moves the fin’s LE back enough to compensate for how the fin area change affected tip-engagement. Skiers familiar with fin adjustments need not be concerned with how these fin area adjustments affect the fin’s roll resistance. Even with a standard fin, fin depth has to be changed a lot before there’s any noticeable change to roll resistance. And these tiny roll resistance changes are quickly adapted to. Changes to the short WhisperFin’s depth affects roll resistance even less. Moving the bindings forward and reducing fin area go hand in hand. The goal is to get binding location to handle as much smear control as possible so the fin can be as small as possible; because the smaller the fin, the softer the tail hooks up at the end of turns. And a soft hookup makes it easier to transition out of turns without wheelies. establishing how far forward the fin’s leading edge can go for maximum power given your current technique. The Fine Tuning Loop is just that. Having established the cornerstone of your setup, binding location, now you can focus on the delicate relationship between tip engagement and smear. You want to experiment with how far forward you can move LE without introducing inconsistent tip-engagement, oscillating between tip-grab and school-bus turns. And you want to fine-tune your angle into the cut with fin area adjustments. The goal is deep, consistent tip-engagement with a survivable amount of over-smear when you accidentally dunk too much tip into the water at mid-turn. Don’t drive yourself mad in the pursuit of perfection—perfection doesn’t exist in water skiing. Err on on the side of consistency and dependability because that’s where confidence lives. And confidence is where personal best performances live.